The shock and awe that has greeted President Obama’s decision to get congressional consent to wage war in Syria underscores the problem with US foreign policy, not to mention our mainstream media machine. Americans somehow think it is standard operating procedure for the Commander-in-Chief to bypass a quaint little place called Congress (Population 535) along the road to war. Perhaps this way of thinking is due to the general atmosphere of fear and loathing now gripping the crotch of the Heartland like a TSA officer. Or maybe it’s just that we’ve been conditioned to believe the president has the right to enjoy dictatorial powers. Whatever the case, the situation demands some consideration. Up until Friday, it looked all but certain that Barack Obama, America’s Nobel-nominated president, would order yet another military strike on a foreign country without congressional approval (Libya was the first). The Democratic leader’s designs for a “limited” strike on Syria, however, were quickly dashed when British Prime Minister David Cameron suffered a historic defeat, as the House of Commons denied him permission to jump on the military bandwagon heading for Syria. This was the first time since 1782 that the British parliament refused a government request to enter a war. Could it be that British intelligence knew something the Americans did not, like perhaps the truth? After all, Cameron himself admitted that the UK intelligence was not 100 percent certain that the Assad government was responsible for the chemical attack. Thanks to the broadside delivered to Washington by the bumpy car of the British parliament, the American people got a fleeting, jolting reminder of their candidate on the early campaign trail, those bygone days of yesteryear when hope hung like dew on the American prairie and the sweet aroma of change dispelled the noxious vapors of George W. Bush’s fighter jets. “I've long believed that our power is rooted not just in our military might, but in our example as a government of the people, by the people, and for the people. And that's why I've made a second decision: I will seek authorization for the use of force from the American people's representatives in Congress,” Obama said Saturday from the Rose Garden. After the initial shock of those incredible words was fully digested, and the dogs of war were yanked snarling and slobbering back in the house, the PR campaign against the Syrian regime went haywire. The US mainstream media was clearly knocked off its stride, set as it was for an imminent war. Consider this opening paragraph in Monday’s issue of The Wall Street Journal. America’s leading business paper somehow believes that seeking congressional approval for war will “risk his credibility and America’s standing in the world.” Indeed, considering America’s basement rankings in the world, seeking such approval as mandated by international law could only have the opposite effect. And what is one to make of Obama’s (money-back?) guarantee of a “narrow and limited” cruise missile attack on Syria; a Lawrence-esque back-before-dinner jaunt that won’t leave the same kind of trillion-dollar aftertaste that the eight-year Iraq War did? After all, it will only take the firing of a single Syrian missile at a US naval vessel for Obama’s weekend fling to transmogrify into World War III. The editorial then entered hand-wringing, hysteria mode, trembling at the thought that a single square-mile of real estate in a corner of the empire has not been stamped with the imprint of a US Army boot. With some 900 US military bases now straddling a disproportionate amount of the globe, it will take a lot more Congress voting to take a pass on a military scuffle in a Syrian civil war for the US war machine to suddenly go wobbly. Yes, the Obama administration will have to swallow a big slab of humble pie if Congress doesn’t vote in favor of war, but the long-term consequences in the event of such a decision on American power should not be exaggerated. But exaggerating the consequences is exactly what America does best. Just one day after Obama had his faith miraculously restored in the battered US Constitution, Secretary of State John Kerry announced that a little birdie informed him that sarin nerve gas was used in the Damascus attack. This revelation allowed Kerry to pull out the most-effective ploy in the PR bag of tricks: the noxious Nazi analogy. “In the last 24 hours, we have learned through samples that were provided to the United States that have now been tested from first responders in east Damascus, and hair samples and blood samples have tested positive for signatures of sarin,” he continued. "This is squarely now in the hands of Congress," Kerry told CNN, saying he had confidence "they will do what is right because they understand the stakes." Meanwhile, the calm voice of reason against a senseless war in Syria has been thrown under the bus. Ron Paul was branded a “conspiracy theorist” by Salon for suggesting that the Syrian chemical attack was a false flag operation designed to get America into another Middle East war. Paul pointed to the false intelligence that led to the Iraq War to back up his statement. 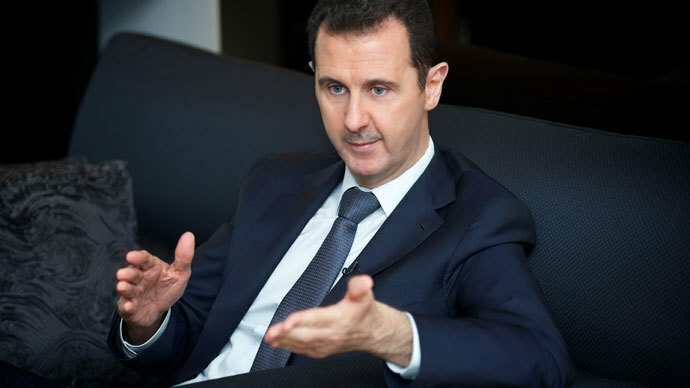 “[Syrian President Bashar] Assad, I don’t think is an idiot. I don’t think he would do this on purpose,” Paul told Fox News host Neil Cavuto on the allegation that Assad used chemical weapons on civilians. Finally, infowars.com reported that Syrian rebels in the Damascus suburb of Ghouta admitted to Associated Press correspondent Dale Gavlak that they were responsible for the chemical weapons attack, revealing that the casualties were the result of an accident caused by rebels mishandling chemical weapons provided to them by Saudi Arabia. Any story that challenges the one-world perspective of the US mainstream media will be ignored and condemned as just another “conspiracy,” just as they ignored the millions of critics in the build up to the Iraq War. With a little bit of luck, however, truth may finally get the last word in the upcoming congressional debate on Syria.